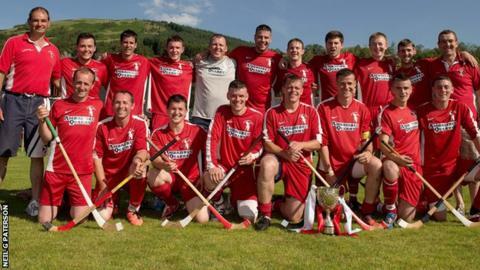 Shinty's National Division has been dealt a blow with Bute refusing to take their place in the league for the forthcoming season. A second league reconstruction plan in as many years was agreed at the recent Camanachd Association annual meeting. Bute had initially opposed the original changes last season but did take their place in the National Division. They finished bottom, however, and are unwilling to take their place next term due to the demands of the schedule. Alan Liddell of Bute Shinty Club told BBC Scotland: "We consider this a good thing. We aren't in a position to compete in the National Division. "We are investing heavily in youth and grassroots and have plenty of youngsters to bring on who are not ready for that level. "A number of older players have retired, but in two or three years, we'll be strong again. "The National Division is just too hard for us right now. It's not good for us or the other teams." Glenorchy were also considering refusing to take part next season but agreed after a player vote to press ahead, despite concerns over whether they will be able to fulfil their fixtures. Their secretary, Findlay Ross, said: "We've faced a perfect storm of players retiring and players heading off to university. "Some teams have gone down to a single team, but we feared we'd lose our youngsters by doing that. "We'll be alright for the first few games, but once suspension, injury and work commitments kick in, we may struggle to see out the season." It was expected that at least one club may opt to drop down a division, given the challenges some teams face. Torquil MacLeod, Chief Executive of the Camanachd Association, said: "We'd anticipated it and there's a discussion now just to take place with a number of clubs, and with the board to decide who's going to step up and take that spot. "They just don't feel they have the strength and depth to participate at that level. Within small communities the strength comes and goes. It happens fairly often and is not an exception or a particular worry. "Our job is to work with the club and help them rebuild. "I would hope we would have more teams competing in the leagues next season than we had last season. That's a reflection on growth. "That's a really positive story for shinty and something that we are going to try and maintain and develop further."